I went to the opening night of the occult art exhibition I:MAGE on Tuesday evening. 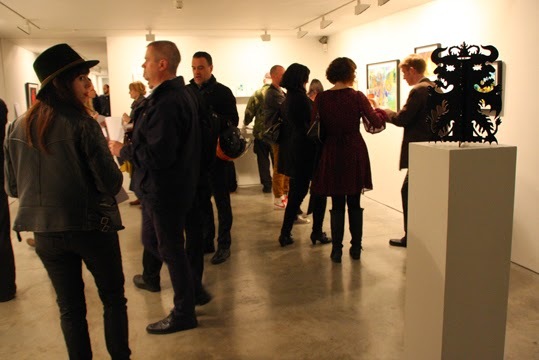 The photo above shows people enjoying the preview party in just one of the rooms at Cob Gallery, in Camden, where the exhibition is on until 2 November. The theme is Travelling with Unfamiliar Spirits and is spread over three rooms, each with a different focus - social spirits, local spirits and personal spirits. The pictures, photographs and sculpture on display are varied, fascinating and really thought-provoking - well worth visiting to have a look, especially as it is free to just browse. A series of workshops and lectures is also running over the fortnight - some at the gallery in the evening and others at a one-day conference at the Warburg Institute this Saturday. You can find out more here: http://fulgur.co.uk/events/. The Cob Gallery is at 205 Royal College St, London NW1 0SG.